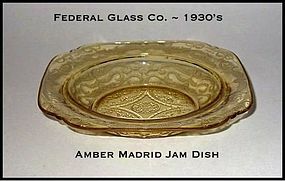 This 6 3/4" amber Madrid Jam Dish was made by The Federal Glass Co. in the 1930's. It is in excellent condition! We have 1 jam dish available for $35.00. 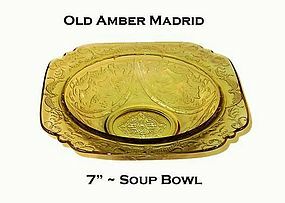 This 7" rimmed soup bowl in the Madrid amber pattern is in excellent condition! It was made in the 1930's by the Federal Glass Co.